Sorrel seems to be scarce these days, now that the season is long gone. The only sorrel available nowadays is the dried one that you can buy at the supermarket or at the market. 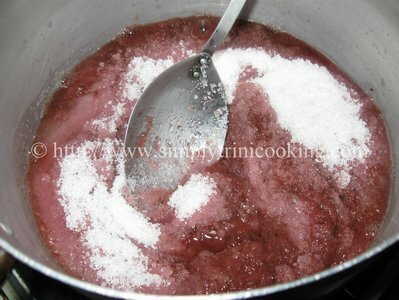 So, when I made my sorrel drink the other day, I just could not throw away that sorrel pulp (good money spend to boot!). The old people like to say “waste not, want not“, and true to form, we Trinis make use of everything once it can be used. For instance coconut bake is made from leftover coconut husk from which the coconut milk was squeezed and used in dishes like pelau, or coconut oil. Leftover bread is used to make bread pudding. The skin of the pineapple is used to make a pineapple juice. And, the skin of the Shaddock is used to make candy (that is one I am yet to do). Not to mention as well, leftover orange peel is used to make orange peel tea, a favourite remedy for indigestion and gas. In that same vein today, I have sorrel jam for you. A very easy recipe to follow, just like granny used to make it. ( actually granny used to make this along with red cherries and plums) Free from all that artificial flavoring and preservatives. 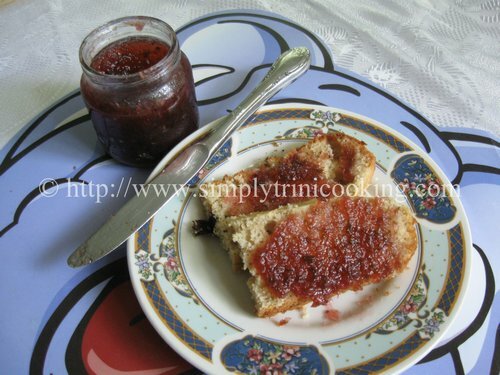 You won’t hesitate to give this lovely sorrel jam to your children, because it is undoubtly all natural. Jam is a very handy ingredient to have in the kitchen. You can add it to bread for breakfast, or add it to your favorite cookies. I love a jam and peanut butter sandwich at times. but, how about a local jam and peanut butter? Sorrel Jam perhaps? 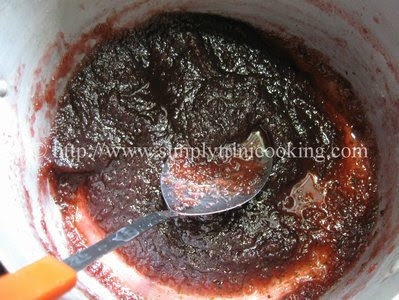 Here is sorrel jam, a true trini favourite. Enjoy. 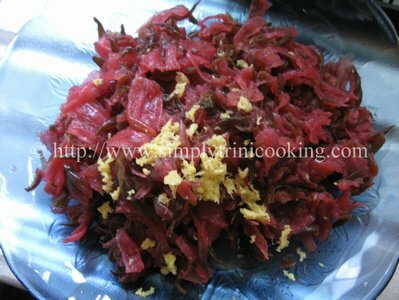 Boiled sorrel and grated ginger. Please note that the sorrel was boiled with nutmeg, spice and cinnamon sticks in water. The water was used to make sorrel drink. 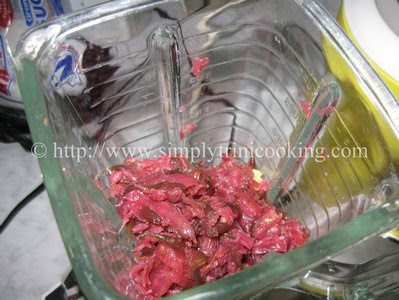 However, the sorrel pulp retained the flavor from the spices. 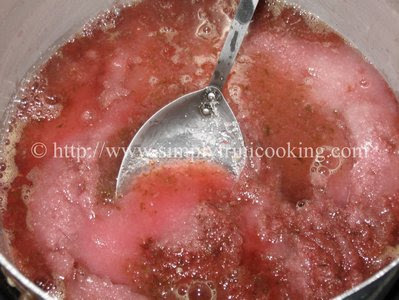 So there is no need to add these spices when you are making this sorrel jam recipe. 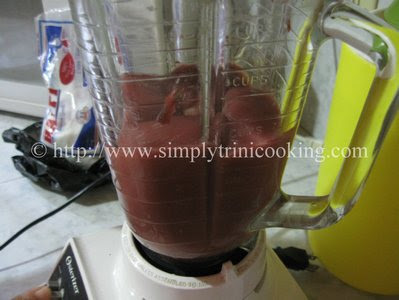 Blend the sorrel and ginger. and one cup of water. 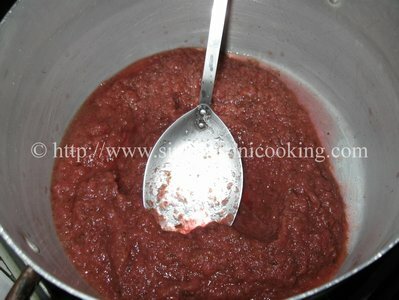 Place on a low flame and allow to simmer until the mixture gets thick. You may have to stir the mixture occasionally. There you have it all natural without any preservatives. A jam everyone can enjoy. Hope you liked it. So, now for the million dollar question….. What have I been doing that I couldn’t post a simple Trini recipe??? Well, that’s easy to answer …Look around you and tell me what you notice… A lot of work was being done to the site in the background and it’s only now that the dust has settled. What do you think about the new layout?…I like to call it Simply trini cooking 2.0: the slimmer, sleeker, faster template for 2011. And then we have the addition of the QR code for my mobile visitors. Yes folks we gone mobile. Now you can get me on yuh blackberry, iPhone, Android or what have you. So if you are on the beach Maracas Bay, in some apartment far from home “in de cold” or up Caura river and forget how much curry to add to the curry chicken, or how to make pelau, ah have yuh back. 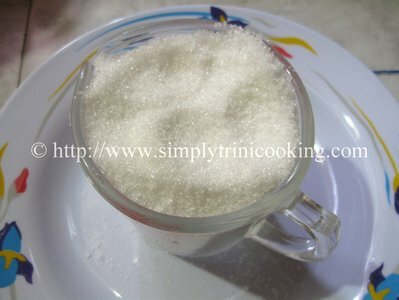 Just look up simplytrinicooking.com on yuh smart phone and yuh in biznis. I also added some extra stuff like the news, games and kitchen remodeling tips each of which still have a few brushing up to do still. So have fun looking around while I add the finishing touches. 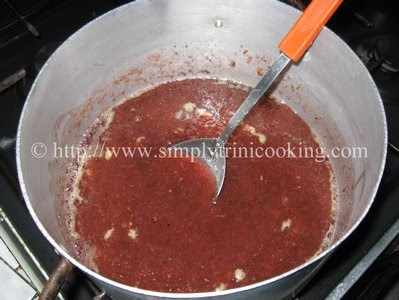 Don’t forget to leave your comments on sorrel jam in the comment box below. I don’t like being in the kitchen too long nor complicated recipes but this is just perfect! Thank you very much ??? ?